On 28 March at the Scottish Parliament Epilepsy Consortium Scotland held their latest Cross Party Group Meeting. The topic discussed on this occasion was Sudden Unexpected Death in Epilepsy and those who attended came from a variety of backgrounds, some clinical and others with personal experience of this issue. Below is a synopsis of research currently being carried out by Gashirai Mbizvo. Gashirai Mbizvo is a junior doctor and Clinical Research Fellow at The University of Edinburgh’s Muir Maxwell Epilepsy Centre, which is part of the Centre for Clinical Brain Sciences. He is currently completing a PhD funded by Epilepsy Research UK, The Juliet Bergqvist Memorial Fund, and also supported by Epilepsy Scotland. He is supervised by Richard Chin, Susan Duncan, and Colin Simpson. 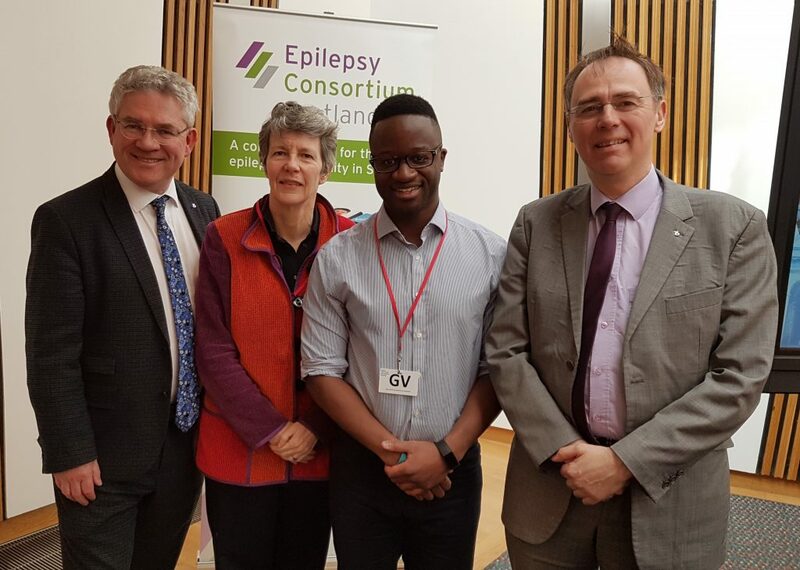 His PhD project is entitled the Scottish Epilepsy Deaths Study (SEDS), and he presented this alongside Susan Duncan at Epilepsy Consortium Scotland, the Cross Party Group meeting held at Scottish Parliament, Holyrood on 28 March 2019. SEDS is a nationwide study using anonymised linked administrative healthcare data to identify and characterise the burden of epilepsy-related mortality in Scotland. Results of the SEDS study indicate several important themes, including that the burden of epilepsy-related mortality in Scotland remains high, many may be potentially avoidable, and it appears to be young adults at highest risk. The SEDS study is currently ongoing and is designed to help raise awareness of the problem of epilepsy-related mortality, and on completion it will make several recommendations on how the situation might be improved going forward.